A few paintings resting before installation takes place. A few days ago, 16 of my Nooks & Crannies series of paintings made their way via our intrepid Honda Element to Tucson International Airport. My work is being shown with Rhod Lauffer. He had already dropped his drawings off, so I didn't have the opportunity to meet him. The trolley on the left has Rhod Lauffer's work stacked on it, ready for installation. His website shows some of his wonderful paintings. You'll just have to come to the show to see his drawings of airport/airline related Nooks & Crannies. Yet another view of the gallery space. 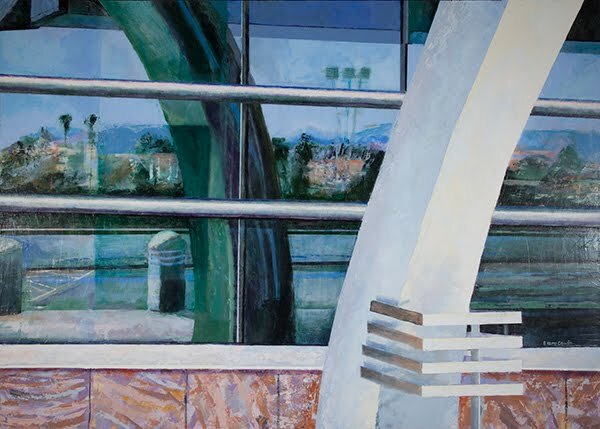 It was fun to see the Tucson Airport Reflection painting in the gallery space since the painting was created especially for this exhibit. The exhibit is located on the lower level of the airport will be up until December 11. I'm anxious to drive back down there to see how the work looks on the walls! Good luck with this show Barb.